Long-term performance charts are often used as marketing tools. No serious quant analyst will ever base future performance prospects on long-term charts, especially from periods where there were no electricity, cars, planes and telephones. Many arguments about the efficacy of some trading strategies, such as trend-following and momentum in general, are based on long-term charts. We have talked about the perils of relying on such charts several times in this blog. Usually naive academics without skin-in-the-game of trading and marketing people rely on long-term charts. Professional traders are always skeptical and some astute quants pay only attention to performance during certain difficult periods, for example the 2008 bear market and 2011 correction, and concentrate on recent data, especially if their strategies are in faster timeframes. The main argument of those who insist on using longer-term performance charts is that human behavior has not changed. Despite the fact that this has to be proven, even if it has not, and let us assume that for a moment, the mix of market participants has changed drastically in last 10 years and algo trading dominates nowadays. In fact, stock pickers and discretionary traders have virtually disappeared from the market. Therefore, the argument of invariant human behavior, even if true, does not even apply. Certainly, the above backtest looks fantastic. The naive academic and the marketeer get excited immediately but the professional trader does not. This is why below. Although longer-term averages look attractive, for example CAGR is slightly above buy and hold, while maximum drawdown is about half of that of buy and hold, there are long periods of stagnation. 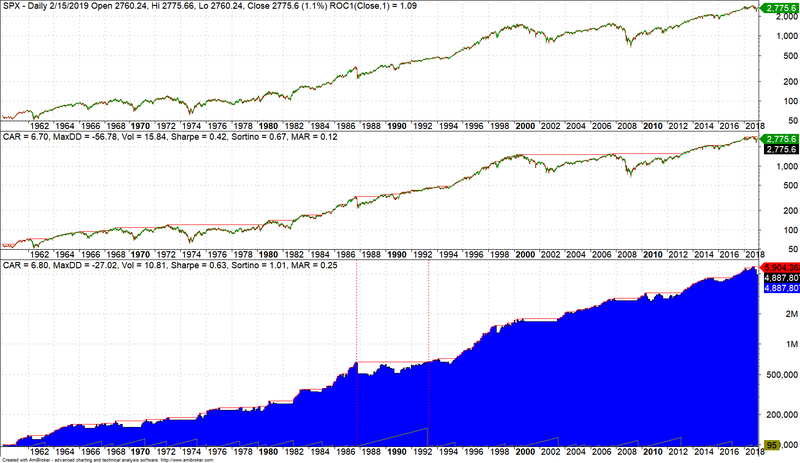 For instance, from September 1987 to March 1993, equity is nearly flat, as shown in the chart above. This is a period of about five and a half years that this strategy was out of the market and for a good reason, as proponents of this approach would insist. But the counter-argument is that during the same period there is activity in the markets and despite the downtrend, which this strategy avoids, one could profit by using other strategies. Obviously, assessment of performance depends on investment horizon, objectives and timing of entry. For an investor who expects income this may turn out to be a horrible strategy in case of long stagnation period while the buy and holder gets at least a dividend stream while the losses are unrealized and can be later recovered. The worst case scenario is rarely discussed by those who present longer-term charts. This is the scenario of an extended sideways market. Although this has not occurred in U.S. markets yet, there is no guarantee it will not in the future. Until now bear market recovery has occurred in the form of a V-bottom, But that has not been the case in emerging markets. Below is the same 12-month moving average strategy applied to EEM ETF that shows 10 years of recovery period from equity highs. In the above chart there are two problem with this strategy: (a) a long period of recovery and (b) high drawdown in the process of recovery due to accumulated losses from failed signals. Could a similar situation also occur in U.S. stock markets? The marketeers who showed the longer-term chart – some charts even start hundreds of years ago – will insist that this is impossible. But the quant knows that if the probability of an event is not zero – and we are talking about risk of ruin here – the event will occur at some point in time. Is the probability of ruin of momentum, price series, relative or absolute, zero or small but finite? The emerging markets chart above shows that extended sideways markets can happen. 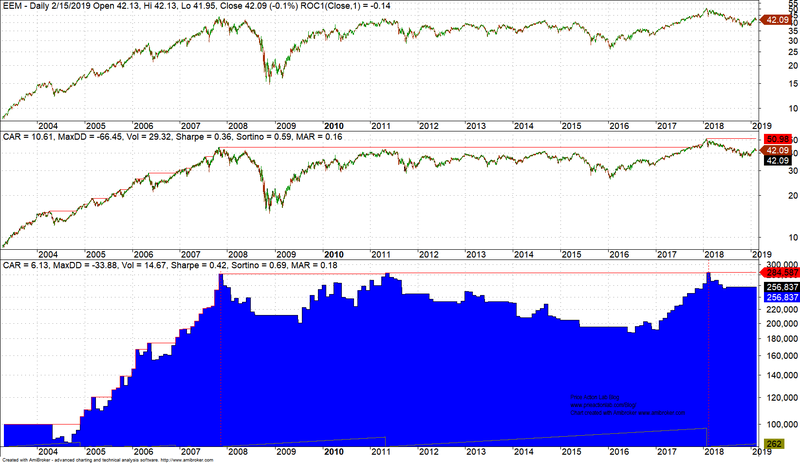 During such markets price series momentum is a store of negative value. Risk of ruin increases and uncle point can be reached. No serious quant will even allocate a large percentage of capital to such strategies. There strategies have a serious disadvantage even when compared to buy and hold due to stream of dividends provided by the latter, which offers some income to investors to survive a bad long performance period while losses remain unrealized and can be recovered when markets recover. However, losses of momentum are often realized and can only be recovered with more momentum periods. Therefore, the decision of the overwhelming majority of investors to invest in passive funds is rational since the naive academics and marketeers of long-term charts do not provide a robust alternative to the problem of long recoveries but only promises based on chart illusions.